The demonic, quadruped cousin of Grand King Ghidorah gave his opponents a death stare. Three of them. His new enemies, one being a proud god of the Seatopians, the other two were considered a warrior and a support for the Xiliens. Megalon was the "God", Gigan was the "Support", and Monster X was the "Warrior". Even though borrowed from the Seatopians, Megalon, along with his two teammates, were "exiled" by the Xilien leader "X". One too many failures caused the ruthless ruler of Planet X to cast away his three kaiju into the vacuum of space. The monsters felt betrayed. All they wanted now was to seek and destroy any daring monster who even came close to them. Once finding their way to the Earth's moon, their call was answered. Desghidorah landed on the sphere and accepted the challenge. Not wasting anytime, Desghidorah fired off three lava gout blasts from his mouths attempting to strike his opponents. All three monsters jumped out of the way of each blast who then looked face-to-face with all three of Desghidorah's heads. At that moment, they all witnessed the unholy, hellacious look in Desghidorah's eyes and felt something they haven't felt in a while: Fear. Not Monster X though. He didn't really care. Hell, he didn't really care about anything. Not even being exiled. Gigan and Megalon screeched at their new enemy and proceeded to leap toward it. The duo landed in front of Desghidorah and gave way with their weaponized hands. Gigan smacked Desghidorah across the right neck and side with his claws while Megalon smacked him on the opposite side with his half-drills. Desghidorah shrieked out, being caught off guard by this sudden attack. The three-headed dragon then whacked Gigan and Megalon away with his central head. The duo was forced to back away for a moment until charging at the demon. Desghidorah would not be fooled this time and pelted the duo with lava gout blasts in mid-air. Gigan and Megalon cried out in agony as they fell to the ground...slowly. The Moon's gravity was lighter than the Earths so they fell at a somewhat slower, but steady speed. Once they looked up, Desghidorah was already on top of them! Not wanting them to get a chance, Desghidorah reared himself upward and attempted to squash the two bugs until golden, agonizing beams collided with his skin. The dragon wailed out as he had felt the full force of Monster X's gravity beams. Desghidorah turned around and faced his new attacker ready to stomp its lights out. Monster X didn't retaliate. Instead, the skeletal beast tilted his head backward and roared louder than anything imaginable. That was Gigan and Megalon's wake up call to pull another surprise attack. Megalon landed on Desghidorah's back while Gigan flew in circles above them. Desghidorah was ambushed and tried his best to dislodge the god beetle, shaking his massive form. Megalon kept his balance and whacked Desghidorah over and over again with his drills while Gigan rained cluster-light rays onto the four-legged dragon. The blasts spread and exploded all over Desghidorah's torso but didn't faze him. Now infuriated, Desghidorah spread his massive, red wings and chased Gigan. The cyborg laughed at the thought that his opponent was outnumbered until he spun around and smashed into Desghidorah. Gigan shrieked as he spun out of control before landing near Monster X. Megalon was still on the dragons back side battering him but to no avail. Desghidorah got sick of the games and unleashed a powerful shock pulse. Megalon screeched in much pain as he fell from space and landed right next to Monster X. The bony creature observed Desghidorah's flight capabilities and saw it wasn't very maneuverable because of its bulk. Closing in on its every move, Monster X finally lit up his eyes from devilish-red to godly-golden and accurately hit Desghidorah with his gravity beams. The demonic dragon wailed out in pain but the blasts only caused it to rage. Desghidorah flew straight for Monster X at full speed ready to bulldoze his opponent to Hell. Monster X dodged the speeding dragon just in the nick of time. Desghidorah wouldn't stop though as Megalon stood up again, recovering from the shock pulse, and felt the full force of Desghidorah's ramming technique. The Seatopian God flew for about twenty seconds before crashing to the hard, grayish ground. Gigan got back up and flew at Desghidorah screeching at him. The demonic dragon turned around and felt a gigantic claw slice into his chest. Desghidorah cried out, his chest had been gashed open and was spraying blood everywhere. Gigan stood in front of Desghidorah hoping he could pull that move off once again. Desghidorah wouldn't have any of it. The enraged monster clamped onto Gigan's left blade with one of his heads and sent electricity surging into his system. Parts of Gigan's arm circuitry had fried and smoked causing the cyborg to panic. Gigan swung his right scythe wildly until making contact, carving Desghidorah's left neck open. Desghidorah roared angrily as he was forced to release his grip. Gigan backed up and shot Desghidorah with a cluster-light ray which exploded all over his body. Desghidorah barely even felt the pathetic excuse of a beam weapon and retaliated with six lava gout blasts right into Gigan. The blue cyborg shrieked in annoyance as the hot blasts collided with his metal armor. Gigan swung his right scythe at Desghidorah's chest again but the dragon was ready this time. Desghidorah used his frontal legs like a spring and used the momentum to stay upward with his hind legs. Desghidorah brought himself downward ready to stomp on Gigan but failed as the cyborg moved slightly out of the way. Not moving fast enough, Gigan felt rows of menacing teeth sink into his middle and right wing causing him to cry out. Desghidorah sent more electrified energy into his bites causing the upper part of Gigan's wings to become charred. Gigan had to dislodge this beast somehow and came up with an idea. The spiky, metal death-trap threw his right blade into Desghidorah's ribcage forcing him to let go again. Desghidorah cried out again as the sharp object penetrated his thick skin. Before he could make his next move, Megalon and Monster X pounced onto him and let loose their full strength. Megalon bludgeoned Desghidorah with his drills once again while Monster X pounded on him with his fists. Desghidorah felt every last blow and it was the opposite of harmless. Monster X then jumped up and back handed Desghidorah in the central head while tail-swiping the right one. All three monsters were pounding on Desghidorah but his thick armor and stubbornness wouldn't allow him to give in. Desghidorah fired lava gout blasts into every monster’s face, causing them to topple onto their backs except for Monster X. He was tougher and more durable than his partners so the best the blasts could do was cause him to stagger. Monster X almost instantly recovered from the attack and put Desghidorah's middle head into a headlock. Gigan and Megalon got back to their feet and decided to mimic Monster X's strategy, seeing as it looked logical. It was, but not for long. Desghidorah used all his incredible neck muscle strength and tossed all three monsters away from him, sending them crashing to the ground. All three monsters were starting to stand upright when the dragon moved to be nearly on top of Monster X. Not being able to react quickly, Monster X was lifted right off the ground by all three of Desghidorah's jaws and was slammed back down. Desghidorah pulled this tactic off three times before sending the skeletal creature sailing and crashing hard onto the Moon's surface; hundreds of meters away from him. Now with that pest out of the way for the time being, Desghidorah turned his attention to the buggy duo. Gigan and Megalon had once again felt fear. Not wanting to come close to the powerful dragon, the insect-like monsters stayed back and spammed projectiles. Gigan fired off numerous amounts of cluster-light rays while Megalon spat out napalm bombs. The strategy succeeded and forced Desghidorah to stay put. Megalon fired bolts of lightning into every napalm bomb causing them to detonate faster. A ring of fire surrounded Desghidorah and it seemed as if he was trapped. Gigan and Megalon taunted Desghidorah every second he was trapped inside their little playground of flames. The three-headed monster wasn't stupid though in which he flapped his mighty wings causing hurricane winds to nearly burn out the flames. Gigan and Megalon were suddenly in awe as their enemy flew away from the fire and tackled them to the ground. They were so caught up in laughter that they forgot Desghidorah could even fly. Desghidorah stomped on their bodies releasing cries of pain from each. Megalon looked upward and shot the dragon with an electric blast from his horn which failed to even make Desghidorah flinch. Getting annoyed, Desghidorah forcefully dragged Megalon upward and used his powerful jaws to attack the Seatopian god's star-shaped horn. Megalon was sent into a panic, feeling the horn being pulled. In his frenzy, Megalon activated his drill and drove the rotating contraption into Desghidorah's chest. The drill spun halfway into his chest before stopping, hitting his durable neck muscles. Neither would cave in up until the point where Desghidorah had snapped Megalon's star horn in half! Megalon shrieked and panicked again while taking his drill out of the dragon's chest and clutched his head. Desghidorah roared laughably at the beetle kaiju as it acted like a toddler. Megalon came up with a new plan. Burrow. Megalon spun his drill and dove underground. The insect flew underneath the surface at a remarkable speed of Mach 2 before flying upward toward Desghidorah. The dragon saw it coming though, and right before Megalon could drill-dive into him he snatched Megalon in mid-air with both of his side heads. Desghidorah sent volts of electricity into Megalon's shoulder blades before roasting him alive with Hell's Flames! Megalon struggled as he was held by his will and began to burn alive. The central head of Desghidorah burnt Megalon's head to a crisp and dropped his lifeless body to the ground. Megalon's head now looked like dripping candle wax. Megalon’s blood dripped from the dragon’s jaws, and Desghidorah roared triumphantly; one of his enemies had fallen to his wrath. Suddenly, Gigan ambushed Desghidorah from the back and fired his grapple hooks at Desghidorah's side necks. The cyborg yanked backward while shoving his deadly buzzsaw into Desghidorah's backside forcing him to wail out and whack the Xilien construct with his forked-tail. Gigan recovered from the hit and flew in front of the dragon, trying to saw him in half. Desghidorah would have no part in it and roasted Gigan's saw with his flame causing him to fall back. The grappling hooks snapped off in the process. Gigan screeched in serious pain as his torso was scorched and burnt to ash. Knowing the time was right, Desghidorah spat out another stream of hellish flames but this time into Gigan's visor, melting it instantly. Gigan panicked as he had felt the flames burn him again and lost his eyesight. Desghidorah then pried Gigan's beak open with his side head's mouths and vomited a lava gout blast down his throat with his central head. Gigan shrieked his last shriek as the blast decimated what was left of the cyborg monster’s circuitry, causing his head to detonate in a ball of fire. Desghidorah backed away from Gigan's headless body awaiting it to topple over. The dragon became confused as the body wouldn't fall over. Instead, he witnessed it move! Gigan's body had still been intact and kept on walking until something hit it. Monster X was back after a long break from the battle and kicked his partners body to the curb knowing it was just a piece of walking scrap metal now. Monster X wasn't even infuriated with this beast. He wasn't even upset that his partners were killed off. He was never fond of them in the first place so he didn't really care. He didn't care just about anything. Monster X knew he couldn't run away now as he couldn't fly or be projected upward by an Xilien UFO. He had to stay and fight hoping he'd make it out alive. The skeletal monstrosity charged toward the abomination that stood before him and jumped onto its necks while holding its heads down. Desghidorah roared as he couldn't throw this beast off of him. Monster X held him in the submission hold until Desghidorah expelled a shock pulse forcing him off and onto his back. Monster X stood up quickly, ignoring the pain, and fired gravity beams into Desghidorah's lower neck area and chest. The demonic dragon wailed out as his necks burned and chest bled until neutralized by the gravity beams burning effect. As he was still distracted by the pain, Monster X ran up to Desghidorah and punched him repeatedly in the heads. Desghidorah felt woozy as his skulls were being bashed into. Getting tired of this act, Desghidorah suddenly bit Monster X with his left head, digging his teeth into the twin-horned kaiju’s right arm and drawing black blood. Monster X roared in agony as his arm had been punctured, but wouldn't let up. The bone covered monster then lifted Desghidorah's head off his arm and swatted it away like a fly. 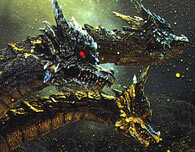 Monster X grabbed each of Desghidorah's two side necks and pushed them downward until they saw sideways. With the central neck still free, Monster X clamped his jaws onto it drawing blood which oozed into his mouth. He didn't care. Blood rushed to Desghidorah's two side heads and he had to act fast. The two restricted heads pelted Monster X in the stomach with lava gout blasts but he ignored the fire balls. Realizing it wasn't working, Desghidorah then spat out a quick stream of Hell's Flame into Monster X's face. The creature staggered back and clutched his burnt face while roaring in agonizing pain. Once Monster X recovered from the fire, he gave Desghidorah a taste of his own medicine and shot off four gravity beams into Desghidorah's left head. The golden death beams caused it to cry out in pain before going limp. With only two heads left in battle, Desghidorah had to finish this fast! Monster X ran toward his ruthless enemy and leaped up. Desghidorah knew what to do at that moment and at the last second, chomped down onto Monster X's throat from both sides. Monster X roared then gargled as he threw up black blood. The massive dragon sent electricity into Monster X's body, frying him. He struggled to get out of the double-choke hold until finally he went limp. Desghidorah unleashed one final shock pulse but didn't let go of the monster in his clutches. The nerves in Monster X's body twitched with every last shocking pain until Desghidorah body slammed him face first as hard as he could onto the ground. Monster X was alive…but he couldn't feel a thing. He was done for. The skeletal demon made it this far but his time was up. He knew that. There was no stopping the inevitable now as Desghidorah shrieked while lifting his two upper feet and dropping his legs back to the surface with incredible force. The impact was so powerful it caused a fissure to spilt open! The inferno of hellish fire rose up out of the Moon and consumed Monster X in flames, bathing the skeletal monster in an agonizing pillar of flame. The once praised warrior of the Xiliens was now nothing more than a motionless husk being sent into eternal oblivion. With one final scream of agony, Monster X was no more. When the pillar subsided, the alien warrior was nothing more than a pile of ash. All three of his opponents were now defeated and gone. Their mission for redemption came in vain as they all fell before a life-eater. The three-headed dragon spread his wings and flew into the deep vacuum of space, searching for a new planet with lush forests and plant life to feed off of.